Georgia is a land where wine has been made for at least 8,000 years. In fact, no where in the world has evidence of wine making been found dating back as far as in Georgia. Also fascinating is the fact that the type of large jars known as kvevri which are still used to make wine in Georgia today have been encountered – with wine residue on them – by archaeologists investigating Neolithic sites in Georgia. 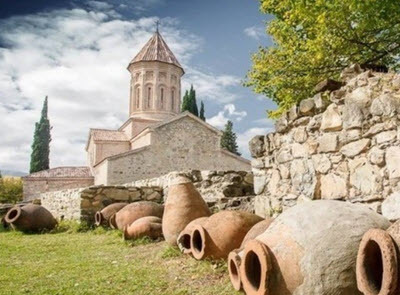 The Georgian tradition of making wine in kvevris has been added to UNESCO’s Intagible Cultural Heritage List. Among the former Soviet Union republics, only Moldovia produces a higher volume of grapes per year than Georgia. Although modern large-scale wineries do exist in Georgia, the country is also home to thousands of small-scale farmers who produce wine, and wine is also produced by certain Christian monasteries. Georgia is a country where some grape growers still practice maglari, i.e. the practice of planting grape vines that will grow up the trunks of fruit trees, creating a scenario where the grapes hang down along the fruits as they ripen. 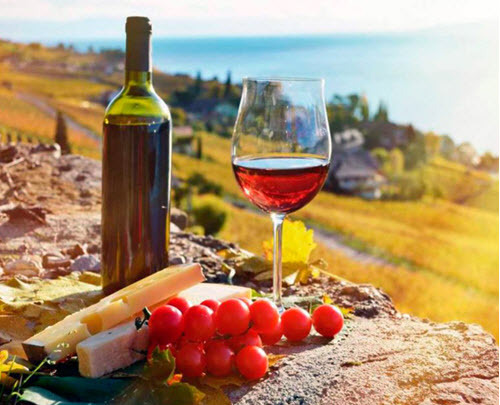 Nowadays, you can find both modern-style wine and very traditional wines in Georgia. Some wine makers still keep the ancient tradition of fermenting crushed grapes, skins, stems and seeds together; a style that has vanished from most other parts of the wine-making world. Georgia’s soil and climate are ideal for growing grapes and making wine, and the geology has create a rich source of natural springs with water that can be utilized to water the vines if necessary. There is also the Caucasian Mountain streams that bring mineral-rich water into the Georgian valleys. The climate is rarely extreme in any direction; the summers are sunny but not excruciatingly hot, and the winters tend to be mild in the valleys. The Black Sea has a balancing effect on the Georgian climate. The principal region is Kakheti, where approximately 70% of all Georgian grapes are grown. 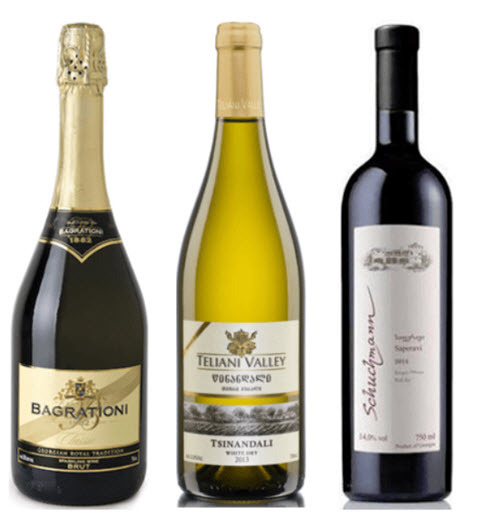 Tsinandali, one of Georgias best-known white wines, is a blend of Rkatsiteli and Mtsvane grapes from Telavi and Kvareli – two micro regions located within Kakheti. A typical Georgian wine bottle etiquette will carry the name of the source region, district or village from whence the wine is. It is common for Georgian wines to be made from a blend of two or more grape varieties, but wines made from a single variety also exist and are not difficult to obtain. This is a naturally semi-sweet red wine with a dark pomegranate color. Taste is velvety and harmonious, with hints of chocolate. Akhasehni is made from Sepravi grapes grown in Akhasehni vineyards in the Gurdzhaani district, which is a part of Kakheti. The dark-ruby colored Khvanchkara is a one of the most popular of the naturally semi-sweet Georgian red wines, and it used to be one of Joseph Stalin’s personal favorites. Khvanchkara is made from Alexandrouli and Mudzhuretuli grapes grown in the Khvanchkara vineyards near Ambrolauri in the Racha region. The golden-yellow Lelo is a fruity port-style wine with a 19% alcohol content, made from Tsitska and Tsolikauri grapes grown in Baghdati, Terjola, Vani, and Zestaponi. At the time of writing, these are the Georgian wine appellations are registered with the country’s intellectural property center Sakpatenti. Kotekhi is also available as a white wine. Kotekhi is also available as a red wine. Rtveli is a traditional vintage and rural harvest holiday in Georgia. During this harvest celebration, which lasts for several days, Georgians revel by holding feasts and enjoying musical performances. There are many Georgian folksongs about wine and wine production. The exact time of the celebration varies depending on where you are in Georgia; eastern regions tend to celebrate in late September while western regions have their Rtveli in mid-October. Typically, people start work early in the morning and then have the festivities towards the end of the day. Amber wine is a type of wine made from white wine grapes where the grape skins are left with the juice for anything from days to months. The grape skins contain phenols, tannins and color pigments that have an impact on the wine, affecting factors such as taste, smell, texture and appearance. This wine making method has been practiced for thousands of years in Georgia, and for at least several hundred years in Slovenia and in Italy’s Friuli-Veniza Giulia district. Amber wine is also known as skin-contact wine. In the United States, certain attempts have been made to market these wines as orange wine. During the Soviet Era, Georgian wines were highly sough after within the Soviet Empire, and they were generally favored over wines from places such as Moldavia and Crimea. Between 1950 and 1985, the vineyards in Georgia went from occupying 143,000 acres to 316,000 acres. In 1985, when Georgia’s wine production exceeded 880,000 tons, Mikhail Gorbechev launched an anti-alcohol campaign that sharply increased the price of vodka, wine and beer, accompanied with partial prohibition, and sales restrictions applied to both amount and time of day. This caused problems for the Georgian wine industry, but the campaign wasn’t long lived – it was ended in 1987. After the fall of the Soviet Empire, several of the former Soviet Republics – including Russia – remained important markets for Georgian wines. In 2006 however, Russian authorities placed an embargo on Georgian wine, claiming that Georgia had been selling counterfeit wine to Russia. Georgia strengthened their resolve to remain strong on other markets, and by 2009, the country was exporting 7.5 million bottles to Ukraine, 2 million bottles to Kazakhastan, 1.2 million bottles to Belarus, over 850,000 bottles to Poland, and nearly 600,000 bottles to Latvia. Georgia is also optimistic about their future ability to grow big on the European Union market, especially after the comprehensive Association Agreement between the EU and Georgia entered into force in 2016. At the time of writing, Georgia is not an official candidate for EU membership, but keep close ties with EU and has expressed a desire to become a candidate. Georgia is a country located south of Russia, where Eastern Europe meats Western Asia in the Caucaus region. It borders to the Black Sea, Russia, Turkey, Armenia, and Azerbaijan. Georgia is almost 70,000 square kilometers in size, and data from the year 2017 show a bit more than 3.7 million people living here. It is a semi-presidential republic where the government is elected through representative democracy. Georgia is a country rich in natural resources and rich in opportunities. There are many ways to make money in the country. One such way is to invest in binary options through a broker in Georgia. Binary options allow you to earn a lot of money while not exposing yourself to any unknown risk. You know how much you can make and how much you can lose when you buy a binary option. Read more about Binary options in Georgia. Always use a demo account to learn how to trade binary options before you start trading using real money. Day trading is not especially widespread in Georgia. There are a few day traders in the country but not many. Georgian Companies are seldom traded by day traders in other countries. If you live in Georgia ( or anywhere else) you can click the link to learn how to start day trading.